Never mind Terms of Play, these are the real rules of engagement – for the parents at least. 1. Thou shall inevitably look after someone else’s children. I make no secret of it, my purpose in going to this bouncy wonderland is to play with (and protect) my one year old. But I always, always, ALWAYS end up with at least one other child attached to me. Duties can include but not be limited to – encouragement and clapping, watching them swing, jump and leap (by order of ‘watch me, watch me’), assist up, down, over and under slides, help into ball pits, help out of ball pits and rescue from frankly terrifying ‘bridge of net’. Meanwhile there is a rogue infant – my own son, tripping, falling, banging, stropping and to be frank, it can all be a bit much – there’s a reason they wouldn’t let me be a Childminder. I am sorry stranger child, if I turn my back, but I gotta make the little dude my first watch. 2. Thou shall refrain from disciplining the holy terror who smacks, bites or claws thy baby, but thou may well encourage thy child to sink his teeth right back. Yes, yes, I know violence is not the answer and nor is being a vampire, but come on, kids are thugs. I am aware my own child will be a thug in due course; he just isn’t old enough to qualify yet (try as he might.) Soft play is lawless chaos, you know it, I know it and they know it. When you have a smaller small though, they don’t – they really don’t. Balls raining down on their heads, violent shoves and aforementioned bites – the poor things don’t know what’s hit ‘em – or who. So until they’re old enough to manage the situation sensibly (in say 30 years,) forgive me if I tut and telepathically encourage my son to have himself a sharp nibble back. 3. Thou shall always purchase an overpriced chip butty or at the very least a Hot Chocolate and a muffin. 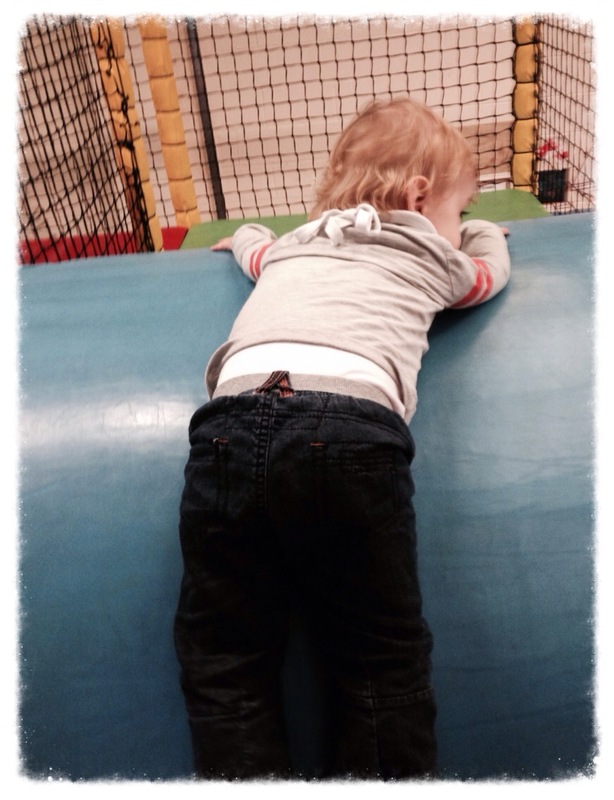 Nothing whets your appetite like charging around on your hands and knees and getting your bum stuck on the slide. I can’t be alone here, surely? Inflated as their prices may be, the fat-soaked shizzle ain’t half tasty; if only I could actually scoff it hot and in peace. Though I guess if I expect the latter, I’ve really got to have a word with myself about the realities of parenthood. 4. Thou shall look with envy and bitterness at parents who are able to eat their food undisturbed and engage with other adults, particularly if thou are involuntarily caring for the other adult’s child. 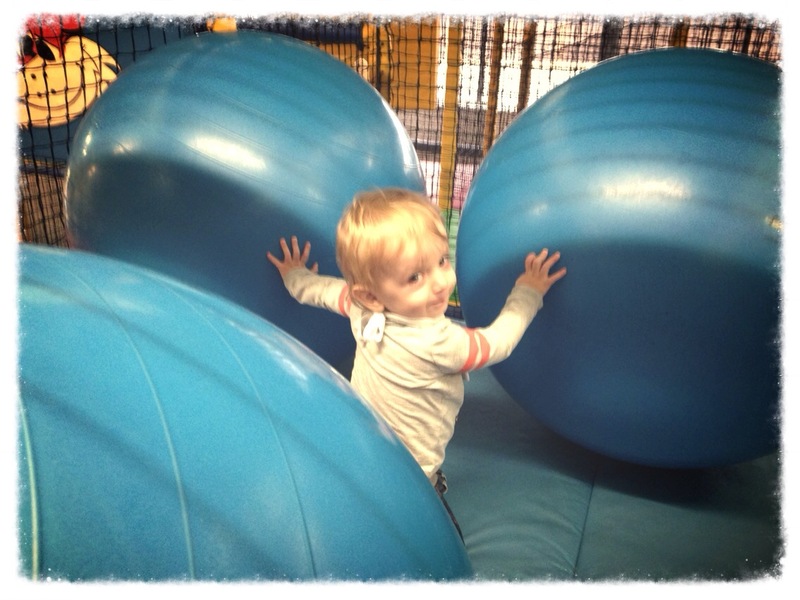 Soft play is a different experience for parents of tiny tots to those of the more mature breed of child. I spend two hours on my hands and knees playing babysitter, bouncer and ball catcher. The other breed of parent spends it drinking hot drinks whilst they are hot and catching up with friends or taking advantage of the free Wi-Fi. Once I even saw someone with a book! Reading! Remember that? But, before the green-eyed monster takes over completely, I must remember that soon it will be my turn to ignore my children (or let them play independently and gain confidence, to use the official term) and soft play will be like an actual holiday. 5. Thou shall half-heartedly attempt to stop thy offspring licking every ball and other filthy item for about five minutes, before giving in and resorting to sporadically dusting them with a baby wipe instead. A breeding ground for coughs, colds and all things nasty, soft play is a germy monster’s haven. I’m not saying it isn’t kept clean by the way – it’s far shinier than my shabby abode, but a high volume of small humans plus their insistence on finding and licking every single thing does not help in our quest to keep them bug free for more than a week. But, to avoid conflict (tantrums) I inevitably let him get on with it after five minutes of battle. It builds their immunity anyway… right? 6. Thou shall harvest thy internal rage at older kids playing in the toddler area and mutter under thy breath, whilst upholding thy suppressed British way to never say what thou think. Now this is only if play becomes violence – I am nothing if not reasonable, people. When stompy, rough play does commence I will admit to sometimes rolling my eyes and muttering where are the parents, not that I am really expecting any of the babies to answer or nod understandingly. And I know deep down that I won’t have the energy or strength to be policing my older child when the time comes, and I doubt he would let me. But for the sake of my son’s poor stamped on fingers and subsequent peril, I really do want to scream, ‘YOU HAVE THE WHOLE OF THIS HUGE SOFT PLAY – WHY ARE YOU DESTROYING THIS WONDERLAND BY THROWING YOUR BIG GIANT CHILD WEIGHT AROUND THE UNDER 3 ZONE?’ I don’t though, obviously. 7. Thou shall enjoy the ball pit and slide a little too much at times and forget thy duty of care to offspring. Come on, soft play is amazing! If it wasn’t for all the kids. But having one (and a little one at that) is a great excuse to get stuck in myself – I have no choice, it’s for the baby (but it’s really a bit for me as well). No come on darling, this way – let’s try the slide again, remember you love the slide. What’s that, hooray? Here we go – ready, steady, weeeeee! Soft play is one gym membership I would so stick to, especially when followed by a chip butty. Mmm, tasty exercise! 8. Thou shall avoid under all circumstances, soft play at any weekend or school holiday afternoon, and similarly any ‘kids for a quid day’ if thou does wish to leave without serious injury to child or self. I have an early rising one year old so morning soft play is perfect for us. It’s quiet, he can play happily, wear himself out and most importantly; there’s plenty of room on the big slide for me. However the occasions where I mess with the formula and take an afternoon visit are the times we have paid the price. I can’t help but break Commandment One, for example (too many children to look after, I am but one sleepy Mother,) plus the overload of pheromones racing around seem to double the feral in everyone – tots, children and parents alike and it really isn’t pretty. Don’t do it, or if you do, don’t do it without paracetamol and a shot of whiskey. Oh, and if it is raining in addition to the above, you really must have an actual death wish to cross the threshold. 9. Thou shall ALWAYS time soft play around sleep. Snoozing in the ball pit really isn’t good etiquette, and nor is an over-tired tantrum (from either of us.) The trick is make them so tired they are ready for their precisely scheduled nap, but not too tired that they go rogue and refuse to leave or be reasoned with. Soft play must therefore be strategically planned for maximum benefit to the parent – our mission from the time they wake in the morning being to wear them out for nap time and after nap, for bed time. It’s all about playing the odds and making it work for me. 10. Thou shall always come back for more, despite thy bitching and moaning. Despite its overpriced food, the wild company, the rule breakers (tsk) and the unpaid childcare, soft play really is some sort of magical and mucky kingdom. The squeals of delight (from both the baby and me,) and the pure joy at accomplishing the steps or slide solo (him – I don’t like to show-off) really are well worth any downsides – at least until the next time someone attacks him. What rules do you play by? And do you now need a chip butty as much as me? I get so angry at the older kids. One actually pushed Noah repeatedly the other day, queue me jumping in the ball pit and politely asking this little girl to not do that! I know, like you say, that noah will grow to be one of the rougher older kids but if I ever witness him hurting another child on purpose like that then he would be outta there faster than he can throw himself down the slide! It’s just not on! This made me giggle. We too, our god daughter and her sis to soft play the other week. Ellie, our God daughter, is 8 months old. Her big is is coming up to four. Between two adults we were absolutely exhausted by the time we left, and I didn’t even SEE any hot chocolate! Haha! It’s definitely a work out – of both the mind and body!! I don’t know if I could cope with juggling two, and definitely not without any form of chocolatey reward! Love this! So true…sigh. Mine are 3 and 5 and I still find myself going in with them, playing, assisting, policing and negotiating. Except for last weekend, when I dragged my unwell self to Wacky Warehouse for a friend’s birthday party. I stayed out of it, mainly sitting and chatting to friends…and realised that NO ONE else goes in with their child anymore. I am clearly a 5yo in a 30-something-year-old’s body. Absolutely BRILLIANT! Every one true too!! I’m off soft play for a while though after there was a pile of sick slap bang in the middle of the toddler area and shock horror – no parents of said sicking child to be seen. Eeeeeew. Nice list, definitely true! I have got my large backside stuck on numerous occasion! And the chip butty is expensive but rather scrumptious! One being- thou shalt not poke the eyes out of the parents who make remarks of the age appropriateness of the SN kids tantrums or other behaviours! Oh no, how awful. You must have to deal with all kinds of unnecessary hassle through those kinds of ignorant judgements. Personally, I think some eye poking might actually be in order here! At soft play last week I saw a mum actually sleeping in the ball pool with her one year old playing near her. She was my hero. Though shalt sort the ball pool into groups of colours, lest though should feel a teensy bit bored, for it takes many hours of thy time. But thou shalt not feel urges to strangle thy first child who destroyeth said arrangement. Ha ha ha! I love it – the absolute cheek of some young though, no consideration or thought etc. etc. This reminds me of the times I absolutely do NOT get uptight when colouring in with my son and he messes up my neat little picture with his scribbles. Ahem. Oh my…….I feel we could write a book on all of our collective experiences…during one visit a child did a wee in the ball pool, the staff went in and just swished a mucky mop about!!!! (We left quick sharp!) then there are the overflowing nappy bins (who would have thought there would be so many parents inconveniently wanting to dispose of their child’s nappies whilst throwing heaps of cash the way of the play gym owner by purchasing expensive chip butties?) My youngest is now 6, so we are just about at the end of the soft plays appeal…..but as a new mum, I could not have survived without it! Fab blog!!! Oh no no no about the wee soaked ball pit… and mop – how grim! It seems there is a lot for me still to see over the next few years (unfortunately.) You are right though, it is a life saver as a newer Mum and my little boy so adores it, even without the chip butties! Cute and funny blog! Love this. Looking forward to seeing more from you! Thank you very much! Will have myself a nosey at your blog too! numbers 6 & 7 are definitely me! My two are 4 and 18 months, and although I look enviously at the Mum in the corner READING while her child happily plays independently, I would miss out on the slides and the ball pit. I nearly went into labour taking daughter no.1 to soft play at 8 months pregnant, that and almost getting stuck trying to climb up, ha ha! Oh my, imagine if your waters had gone!! That would have become a soft play urban legend! Glad it’s not just me with the slide addiction.. I’ll probably be gutted when my son doesn’t need me to help anymore! Awe thank you! Off to check yours out shortly!